Celiac Disease | Levine's General Store: The Gluten-Free EatUP! Whether you have Celiac Disease, a gluten intolerance, or pursued a gluten-free lifestyle for other health reasons, finding accessible and tasty food can sometimes be a big challenge. Enter The Gluten-Free Eat Up, a monthly market set to premiere at Freddy’s (627 5th Avenue, between 17th and 18th Streets) on Sunday, February 9. We sat down with market founder Deb Goldstein to learn a bit more about living gluten-free, how the market came about, and what delectable goodies we can look forward to at Freddy’s. SSN: What made you decide to organize the marketplace? DG: About a year and a half ago, my then 4-year-old niece was diagnosed with Celiac Disease. Her parents underwent some big changes in their home food production, and in educating themselves and the rest of us on what Celiac Disease really is. I started recognizing that although awareness and gluten free product selections are growing at a rapid speed, it can be difficult to ascertain what is speaking to the trend of being gluten-free and who and what establishments really understand what gluten free means, especially for people with Celiac. My grandmother had Sprue (another name for Celiac) and my mother learned she had it later in life, which in retrospect I believe played a big part in some of the serious pains she suffered. Hello genetics! It is not enough to simply say that something is gluten-free. 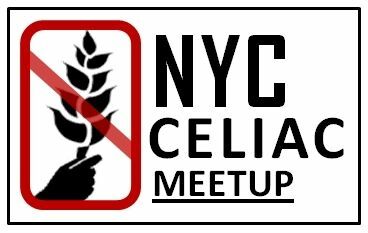 I started doing research on the gluten-free market, trends, statistics, and taking note of what was and what was not available in various neighborhoods in NYC. I wanted to create a place where I could take my niece and not have to worry about cross contamination, or face disbelieving ridicule from strangers. I started to dream of creating a “safe food space” where no gluten had ever entered, but where the food was actually tasty. Going gluten-free does not mean you have to succumb to tasteless food. I am currently working towards opening a gluten-free shop, Levine’s General Store – Gluten Free Provisions, where locally made items, and less “mainstream” gluten-free products can be found and enjoyed. With the help of food designer Antonio Limuaco of Kimcheelicious, we are also launching some gluten-free products of our own. Instead of waiting to find the brick and mortar, we decided it was time to just go for it and start broadening the access to locally made gluten-free foods. There is still a large gap in the gluten-free market, and I wanted to help create another outlet for these new food makers to reach an audience. What are some of the biggest misconceptions about a gluten free diet? 1. First and foremost, it is important to know that Celiac Disease is an autoimmune disease, not an allergy. It is not something you can ever “grow out of.” One of the bigger misconceptions (and there are many) is that people call it a fad. For some people and a fair number of food producers and establishments, being gluten-free does seem like a fad, but the reality for people with Celiac Disease is that a strict gluten-free diet is the ONLY way of preventing severe damage of the small intestine, and its critical functioning. For those with a gluten allergy or intolerance, it is the only way to avoid getting sick. For those who go gluten free for general health reasons or to lose weight, as with any diet, the devil is in the details. A sweet is still a sweet, a highly processed gluten-free food is still not healthy, just like a highly processed food with gluten is not healthy. 2. That gluten-free means you have to buy what is mostly junk in the GF section of groceries, or that this is a very American issue. Italy is probably one of the most advanced in its understanding and policies regarding the dangers of gluten, and in producing foods that are safe. 3. That GF cooking means you have to eat “fake” foods. There are plenty of delicious foods that do not contain gluten naturally. That is what those on a GF diet should try to focus on. Even foods that create alternatives, like bread, sweets and the like need not be loaded with chemicals. 4. A gluten-free diet does not mean eating only a little bit of gluten. A gluten free diet means eating NO gluten. Not a trace. It is especially important for non-Celiacs to understand that even tiny trace amounts of gluten, say 20 parts per million, will trigger antibodies that will attack the small intestine of those with Celiac. What can neighbors attending the market look forward to? For the first market, we will be serving up classic and kimchee grilled cheese with bread from The Gluten Free Bakery of Chatham NY. Freddy’s will be serving up two kinds of gluten free beer. There will be focaccia from Krumville Bakery, vegan chocolates and sweets from Gone Pie, cookies and surprises from Sans Bakery, and Brooklyn Porridge Co. will be serving up a selection of their hearty porridges. There will also be I Heart Keenwah snacks, newcomer Polvilho Bakery will have their artisanal ( addictive) version of Brazils’ national snack Biscoito de Polvilho, and more. The full list of vendors can be found on ourwebsite. Will the market be held at Freddy’s every month? Freddy’s has been incredibly supportive of the market. We hope to hold the market there for as long as they and the space will allow us. As we grow we will consider taking it on the road, but will always come home to Freddy’s! Anything else that we have left out that you’d like the world (well, South Slope/Greenwood Heights) to know about the market? The market is of course open to eaters of all kinds, and Freddy’s kitchen will be serving up their usual yummy menu of foods that are not gluten free. Next month…imported Italian Pastas and Treats from Gee’s Italian Imports. 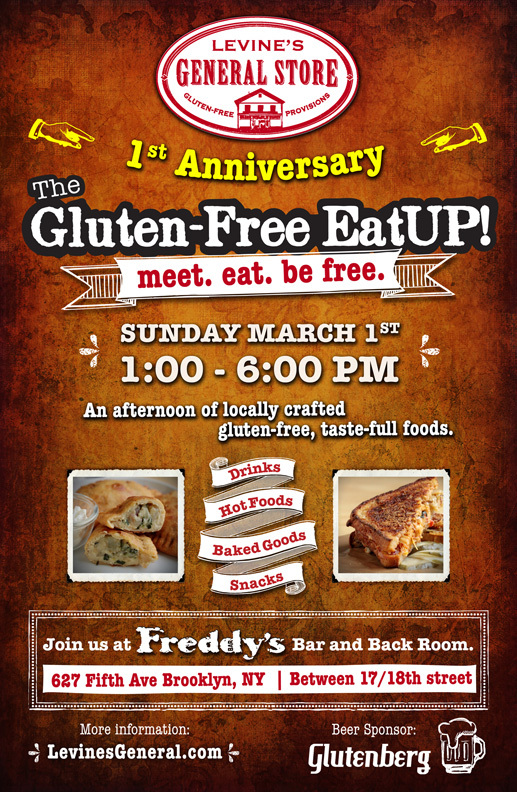 The first Gluten-Free Eat Up will take place at Freddy’s Bar and Backroom on Sunday, February 9, from 1pm to 6pm. For more information, visit the market’sFacebook page, or email Info@LevinesGeneral.com. Tagged Celiac Disease, Freddy's Bar, Gluten Free, Levine's General Store, South Slope, The Gluten Free EatUP!